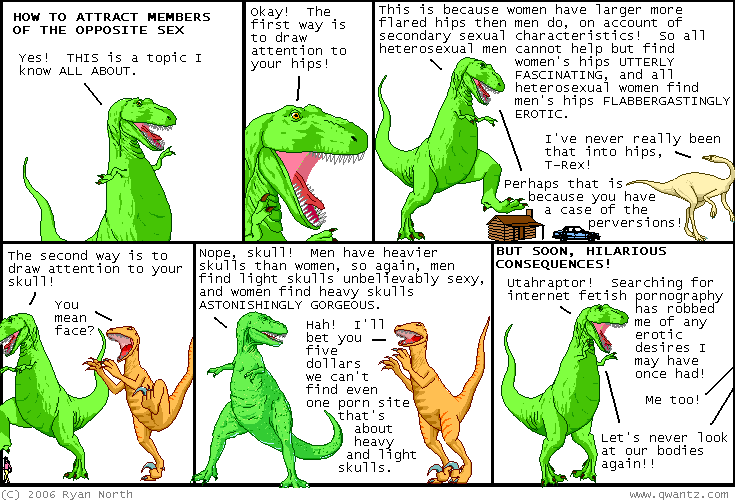 Dinosaur Comics - September 20th, 2006 - awesome fun times! The always-sweet Drawn pointed me towards the site of Ray Frenden, a talented illustrator who has recently made a series of Ninja Turtle drawings in his sketch blog. I bought a set of prints of Leonardo, Donatello, Raphael (who's cool, but crude), and Michelangelo (some manner of party dude) from Ray and they are so excellent. They're framed above my bed! This makes my bed the party bed. I want to invite people over and show them my bedroom, but I don't want them to get the wrong idea.